Check. One more off the list. I keep a list of restaurants and bars, mostly that have newly opened, that I want to try out. I generally strive to get to them within three months, at the latest. Sometimes, for one reason or another, a place lingers on my list. And that’s what happened with Venik. This place has been on my list for a couple of years! I don’t know why it took me so long to get there. Perhaps it was because I also meant to try out the next door spa, Banya 5, and the time just never seemed right. Maybe it’s because South Lake Union is really just finally starting to jell into a destination neighborhood. Whatever the reason, it’s a darn shame that it took me so long to get there. It’s a great little space. And it is little. There are probably ten seats along the bar, another few along a window and about a dozen seats along a series of tables on the far wall. That’s it. 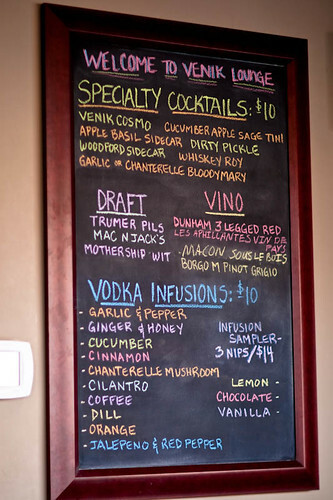 They specialize in inventive cocktails, many made with their infused liquors. There’s also a small menu of light bites. I arrived shortly after 4:00pm, their opening time, to ensure seating for three of us who were meeting. I was the first one in after the doors opened but felt right at home in the neat and tidy place. I took a seat at the bar which has been creatively designed in a kind of swirl which creates two small "tables" at either end. I took the end that allowed three people to face each other. The other, larger end creates a table for four. I started with their apple-sage-cucumber ‘tini as did one of my friends. 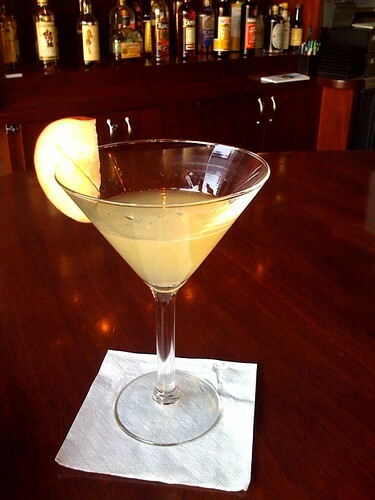 I asked the bartender what they used for the apple, as I’m not a big fan of the usual apple liqueurs. "Apples", he said. And that’s when I realized they had the right idea about their cocktails. The fruit and vegetables lightly flavored the drink which had a stronger sage taste than anything. It was light yet wintery at the same time. The other friend ordered a Cosmopolitan which she rated as just okay. For our second rounds we switched to beer and wine, from their small select menu. Good basic choices for all. To accompany our beverages we started with a mezze platter. 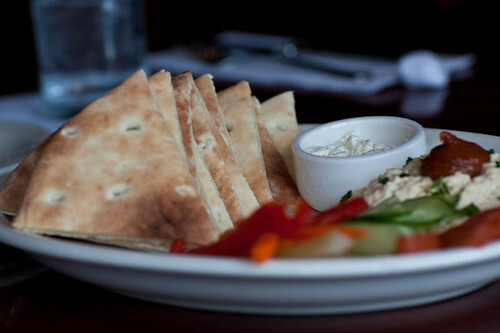 Warm pita anchored one end of the platter, a really good hummus, thinly sliced vegetables and a little bowl of feta rounded out the plate. It was a good plate for sharing and the amounts were generous. We also ordered a bowl of mac ‘n’ cheese. It was good and creamy but wasn’t as cheesy as we hoped. I liked it, it just didn’t really seem like mac ‘n’ cheese. Sometime between 4:30pm and 5:00pm the seats had filled and as we left shortly before 7:00pm the tiny place was bustling with activity. Many of the people seemed to be regulars and there was a great friendly vibe to it all. I think I need to find more reasons to be down in the area so I can stop in again. Happy Hour runs Tuesday – Friday from 4:00pm – 7:00pm and Saturday from 4:00pm – 8:00pm. They are closed Sunday and Monday. The Happy Hour offering is 25% off well drinks, specialty drinks, wine, bottled/draft beer and food, basically everything in the house!